GWP - The word processor formerly known as XWord. GWP is the latest incarnation of the Hungry Programmers' word processor known as XWord. 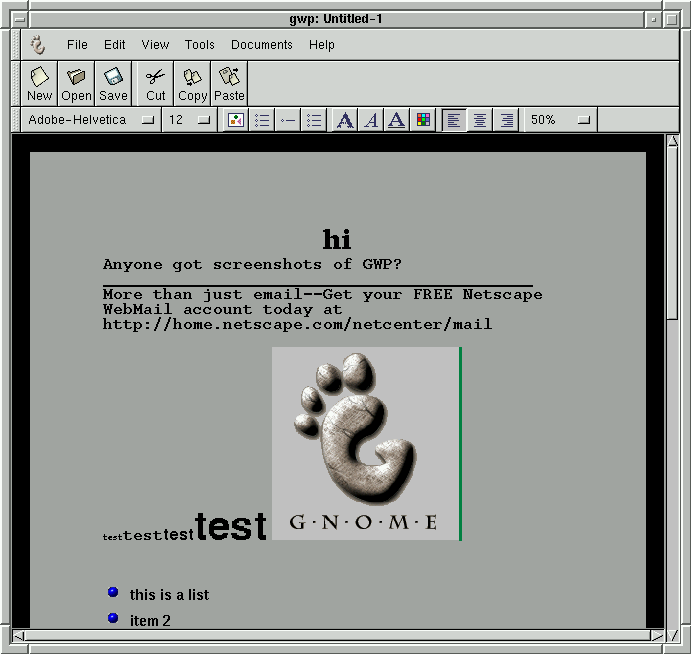 It represents the first version that uses the GTK widget set instead of motif (and lesstif), and is part of the GNOME project's suite of office/productivity tools. Can handle left-to-right, right-to-left, top-to-bottom layout. Plugin architecture, for adding support of new document types, as well as for adding tools that operate on existing documents. 30-10-1998, showing images, multple fontsizes, and lists. Please refer to the GNOME web site for gwp source. As this is part of the GNOME project, it will require the installation of the development sources of GTK and the GNOME libraries.